You have probably noticed that your water pump is not working as efficiently as it was when you first bought it. This is quite normal for an old and worn out water pump. In some instances, it could be due to some problems with the components of the water pump. When you notice that something could be wrong, it may be time to check for signs that the water pump needs repairing or replacing. It is important to note that the water pump repairing is cheaper than the water pump replacement. Repairing the water pump involves fixing a few components that are contributing to the inefficiency while replacing the water pump involves changing the faulty components or installing a new one altogether. This can be due to wear and tear of the old one. So in order to replace a water pump, the first thing to do is to check out for the signs as listed below. When you notice that there is some leaking coming from the pump, however small it is, this is definitely a cause for concern. The mechanical joints and seals can loosen up due to excessive temperature or pressure and corrosion. In this case, the gaskets need to be replaced. On the other hand, if the pump is leaking at the shaft, the mechanical seal needs replacement. Noises in a centrifugal water pump go hand-in-hand with vibrations. This is normally a sign of cavitation, which causes violent shock waves inside the pump. This, in turn, leads to damage to both the impeller and pump housing. When there is an indication of cavitation, it is important to address the matter to prevent any further damage to the pump. The excessive vibration can lead to premature failure of the mechanical seal and bearings. Clogged suction, discharge line or impeller. Worn impeller, wear a ring or wear plate. Wrong impeller rotation. This is when the motor is wired incorrectly and the rotation of the impeller is reversed. These problems can easily be sorted out through the repair. However, if the impeller and other components are worn out, it is time for a replacement. 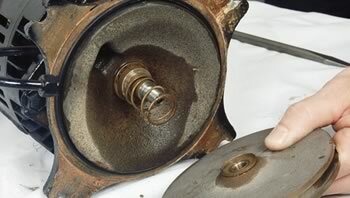 As mentioned earlier, this can be done by replacing some of the components of the water pump or installing a new one. In this section, we shall look into replacing the mechanical seal and impeller, which are the most important components of a water pump that keep it working efficiently. The mechanical seal is found behind the spinning impeller on the motor shaft. Its main function is to prevent water from getting into the delicate electrical motor of the pump. The first thing to do is to turn off the centrifugal water pump from the power supply line. Next, use the PVC saw to cut the plumbing connected to the centrifugal water pump. Make sure you have a spacious workplace to operate from. Use the wrench to unscrew the pump bolts around the pump housing. Thereafter, disconnect the water pump’s motor from the wet end. On the motor, place the wrench and hold it still. Afterward, rotate the centrifugal water pump’s impeller counterclockwise off the shaft to remove it. Next, take the piece of the mechanical seal out of the back of the impeller. Also, slide the remaining seal piece off the shaft. In this step, you can take your new mechanical seal and place it onto the shaft. Thereafter, slide the mechanical seal along the shaft. You should take caution not to touch the front face of the seal with your fingers. This is because the oils from the body can compromise the seal, and thus may not work properly. With the wrench, hold the still shaft and screw the new impeller onto the centrifugal water pump’s motor shaft. After that, line up the bolt holes on the motor and wet ends of the pump. Insert the bolts, then secure the centrifugal water pump ends together with a wrench. The final step involves placing the centrifugal water pump system back into place in the plumbing. Here, you will use the PVC glue and primer to connect and tighten the water pump to the plumbing. Make sure you give the glue time to dry for at least a day before running your pump.